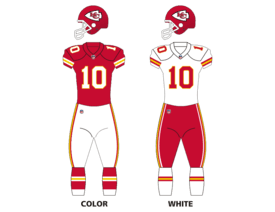 The 2016 Kansas City Chiefs season is the franchise's 47th season in the National Football League, the 57th overall and the fourth under the head coach/general manager tandem of Andy Reid and John Dorsey. On March 9, 2016, the NFL announced that the Chiefs had violated the league's anti-tampering policy, while pursuing wide receiver Jeremy Maclin during the 2015 off-season. The NFL defines tampering as perspective teams contacting soon-to-be free agents before NFL policies allow, which is two days prior to the beginning of the new league year. As punishment, the Chiefs forfeit their 2016 third-round selection, a 2017 sixth-round selection, and were fined $250,000. In addition, head coach Andy Reid was fined $75,000 and general manager John Dorsey was fined $25,000. The Chiefs immediately appealed the decision believing the punishment was excessively harsh and inconsistent with punishments that have given to other teams in similar situations. On April 19, the NFL denied the Chiefs appeal however they did reduce the team's fine to $200,000 and Reid's fine to $60,000. The Chiefs had an NFL best 9 players in the annual Top 100 Players countdown. The Chiefs forfeited their third-round selection as part of the punishment for violating the NFL's anti-tampering policy. The Chiefs acquired an additional fifth-round selection in a trade that sent safety Kelcie McCray to the Seattle Seahawks. *Trade included a conditional draft pick that required Davis to stay on the roster for a specific amount of time and since he did not meet this requirement, the Chiefs receive no compensation. 1 2 "Chiefs lose two draft picks for tampering with Maclin". NFL.com. ↑ "NFL denies Kansas City Chiefs' anti-tampering appeal". NFL.com. ↑ "'Personal health' primary reason for Husain Abdullah to retire". ESPN.com. ↑ Orr, Conor (April 11, 2016). "Ex-Jets, Chiefs DE Mike DeVito announces retirement". NFL.com. Retrieved April 11, 2016.